This bread is a major PITA (pain in the arse), but so worth all the time and effort! It reminds us of Einstein’s Power Bagel, but it comes from the new Amanda Hesser’s New York Times cook book. 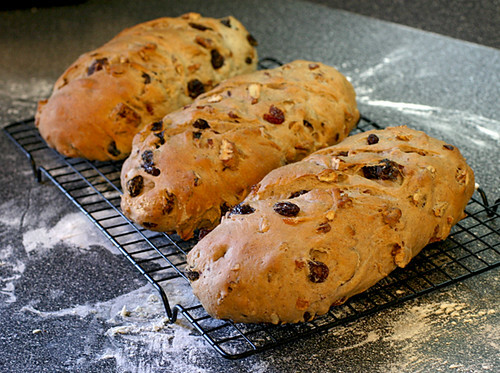 They tout it as Pecan Raisin bread, however much we beg to differ. It’s loaded, and I mean loaded with toasted pecans and raisins. It’s almost impossible to knead them all into the little amount of dough, but keep working at it and it will all come together. One of the annoying parts of this recipe is that you need to start a poolish the day before you plan on actually making the bread. Then on the day you do make the bread, there are two, count them, one, two, 2 plus hour rising periods before these suckers even hit the oven. You would think the loaves would be light and fluffy, but they are quite dense. The recipe makes three loaves, just a little over a pound a piece. You could opt to make them into even smaller loaves, perhaps in the shape of a power bagel. I think I might just try that next time. Yes, I keep making this bread because it is that good, despite its idiosyncrasies and time consuming ways. Stir yeast and water together until milky and foamy and yeast is dissolved. Add the flour and wheat germ and stir just to combine. Cover and leave at room temp for 5 hours! After which you can refrigerate it for up to 48 hours, but be sure to bring to room temp before using. Save the excess liquid for below. and finely grind in a food processor. Place excess raisin ‘water’ in measuring cup and add more water to make 1 1/2 Cups total liquid. Heat to 110-115 in microwave. 1/2 Cup Poolish at room temp. Turn the dough out onto a lightly floured surface and knead for 10 minutes. Slowly folding in raisins and remaining pecans a little at a time. 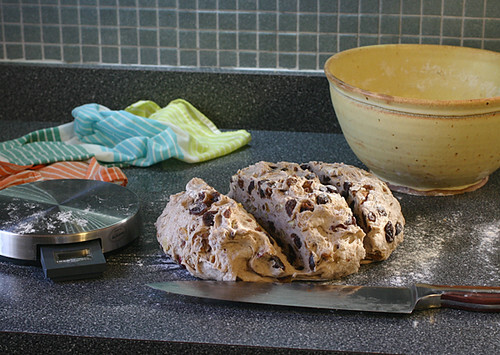 Return the dough to the bowl, cover with a damp tea towel and let rest until doubled in size, about 1-2 hours. Gently turn the dough out onto a lightly floured surface and cut into 3 equal portions, using a scale. Form into loose rounds, cover with a tea towel and let rest for 10 minutes. Gently shape each piece of dough into a short loaf. Place on an insulated baking sheet (or use two regular baking sheets stacked on one another) so your bottoms won’t burn. Cover with a tea towel and let rise until the loaves hold a fingerprint when pressed. Takes anywhere from 30 minutes to 2 hours. Heat oven to 375. Have a spray bottle full of fresh water ready. Slash each loaf 2-3 times on a diagonal. When the oven is HOT spray it thoroughly with water and immediately put the bread in the oven and close the door. Spray the oven NOT THE BREAD 2 more times during the first 5 minutes of baking. Bake until the bread is very brown about 30-45 minutes. Remove from oven and cool on a wire rack. Is this anything like the bread the corner bakery uses for its sweet crisps. I am looking to make my own bread and then toast it by the slice to make the crisps. I live no where near a Corner Bakery. 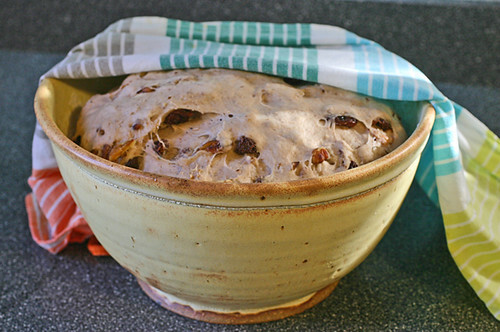 I have never made a poolish and until I saw this recipe had never heard of it. I made this recipe but using TWO cups of flour has made a dough. Is that right??? When I looked up other recipes for poolish, and the description of YOUR poolish, should this actually be only ONE cup of flour??? I don’t think it would matter much, as you only use a little of the poolish in the recipe (seemed to me like a lot to toss out too). I looked at the recipe in THe Essential NYT Cook Book again and sure enough, it says two cups of flour for the poolish. I think next time I make this I will forgo the whole step and see what happens. I’ll let you know in this post how it turns out. Hi Mary, I hope you look at your comments more than I do, hahaha!! How did yours turn out without the poolish?? I just started a poolish (8:00 a.m.) and plan to make my bread this afternoon. It’s been quite a long time since I have made this recipe and I forgot about the consistency of the poolish so just added additional water to it so its not quite as sticky. 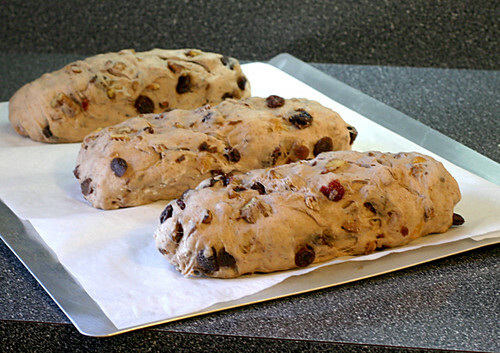 I also make other changes… I make it with dried cranberries which add a lot more flavor and need very little soaking. This recipe seems very daunting, but once you have made it a time or two, its actually quite simple. I think I’m brave enough to try this, but I just want to make sure that when I spray the water. I am only spraying the oven. & then I wonder why? The only reason I know that, is I used to have a full-service bakery under my supervision (not that I knew anything about commercial baking – it was a small part of a big operation). I remember the bakery manager wanted a combi oven (moister and dry heat) in the worst way to make French baguettes. I see where I had commented on this last year!! I can’t begin to tell you how much I love this recipe!! I still only make it with cranberries and now always double the recipe. To anyone making this for the first time, be sure to read the recipe completely before starting. It is very well-written and if you follow each step, you can’t fail. I just have one big question…. Why is it necessary to make SO much poolish when you need so little for the recipe?? What else can I make with the remaining poolish?? I too wondered that myself, I think I even made this recipe once with the dry yeast – my memory is pretty crappy these days, so I’m not sure if I did and if I did – did it turn out. As Homer Simpson would say “DOH!”. I did find a recipe for French bread that calls for almost the exact amount of poolish as is leftover from this recipe when doubled. It turned out fantastic, but just needed a little more salt and actually had the rustic texture of real French bread. Hahaha!! I should have probably read back through this entire thread since I have commented more than anyone over the past few years. It would appear my memory is failing as well. As for my cranberry/pecan bread… For serving, I cut about 1/8″ thick slices, spread with butter, lay buttered side in turbinado sugar then lay them sugar side up on a cookie sheet, spray lightly with water and toast in a convection oven for 10-15 min or until your desired level of tastiness has been achieved. The spritz of water is essential to help set the sugar. … Sorry, that should say, “toastiness.” My iPad autocorrected me.